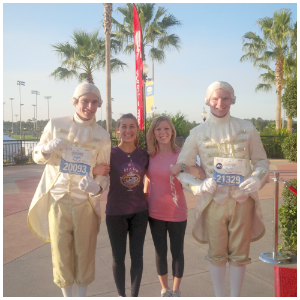 Fairytales and Fitness: Egg-cellent way to make eggs? cooked just right. Sometimes they seem under cooked and sometimes they seem over cooked (meaning they are very rubbery). If I do happen to get the eggs done just right, peeling it is usually a disaster. Maybe one out of six eggs peels seamlessly! Enter the Silicon Egg boil. This is something that Scott and I joked about when we saw it on TV, how hokey, right? But some how it ended up under our Christmas tree this year. First you have to spray the inside of the silicon cups with cooking spray. You can make a hard boiled eggs or scrambled eggs. For hard boiled eggs, just crack it and then pour into the cup. I used a glass bowl to crack the egg but it would be better to use a measuring cup with a spout so it pours into the silicon cup better. If you want to scramble and add ingredients to it, you can do that too. I scrambled the egg in the bowl and added a little spinach and cheese. Now you boil for 19 minutes, which I think is a lot. I usually boil my eggs for around 12 minutes. Remove from heat and cool in cold water. 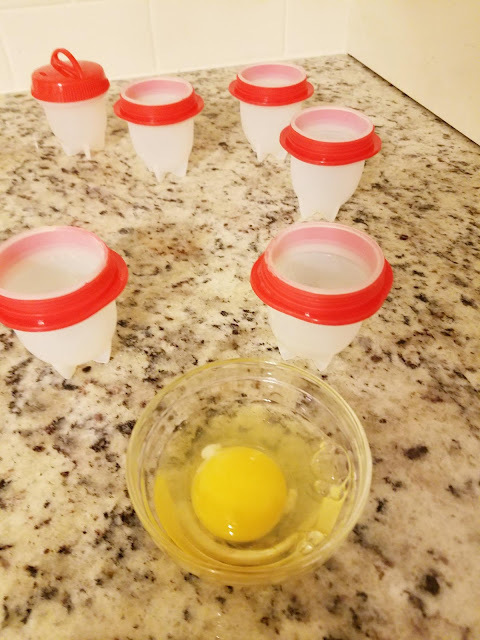 The eggs removed from the cups very easily. I noticed when I pulled the eggs out, it didn't seem like I got a full sized egg (even though I used Large eggs). There are three eggs in the above photo. I don't know how I would make deviled eggs using this method. I also noticed that the scramble egg that I made only had the ingredients on the bottom of the eggs, even though I scrambled it through out. I did enjoy not having to peel the eggs shells off and getting frustrated in the process. This process is kind of time consuming to make hard boiled eggs, but it might be worth it since I don't have to peel them. I'm not sure, the jury's still out! Even thought I put mine into an ice bath afterwards, they still always turn green! I wonder what causes them to turn green? I gave up and started buying the Eggland's Best hard-cooked eggs -- they are peeled too. They are cooked perfectly and have a great consistency -- not rubbery at all. I also tried the baking method - that's pretty good. I've never heard of the baking method. I should look that up! That seems like a lot of work for hard boiled eggs! I just do it the old fashioned way. I wish my eggs turned out the old fashion way! I did not know that about the fresh eggs. Thanks for the tip! I actually saw this in the 'As Seen on TV' store at my mall. 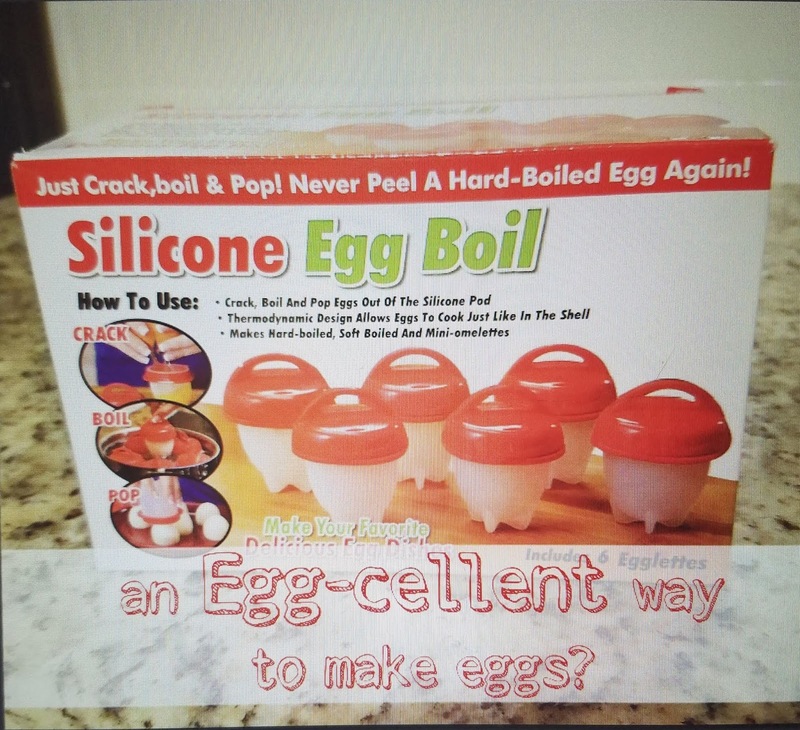 I was curious about it but it does seem like a lot of work to make hard boiled eggs! I haven't decided if the work is worth it, but it is nice not having to peel them! I put my hard boiled eggs in ice water and the shells come off easily. The scrambled egg looks a bit too cooked for me! I'm not sure I'd use this! Yea, they weren't very scrambled. It was like a softer hard boiled egg at most. I've seen those & wondered how they worked. I think my mom bought them but I never heard what she thinks about it. I'm awful at making hard boiled eggs - I loose half the egg trying to get the shell off anyways. I'm the nerd that buys hard boiled eggs already made from the grocery. Seriously. Too expensive. Its like $3.49 for 6 eggs. Yes! That is me. I also lose half the egg taking off the shell. You should see if your mom still has those and try them out. Interesting but i hate hard-boiled eggs. I like them as scrambled, omelets or quiches only. 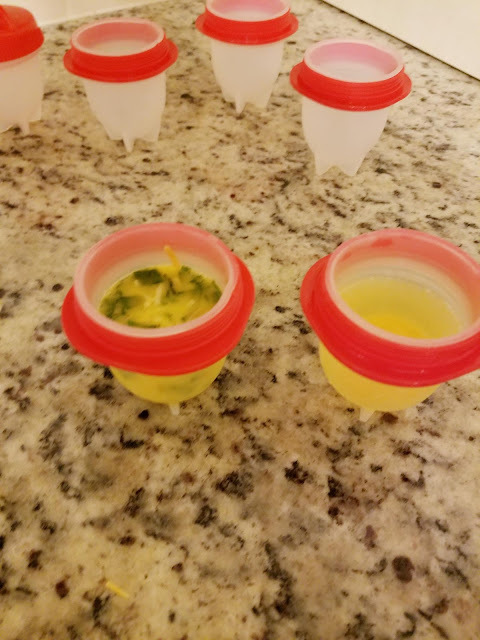 Do you ever make deviled eggs for picnics? 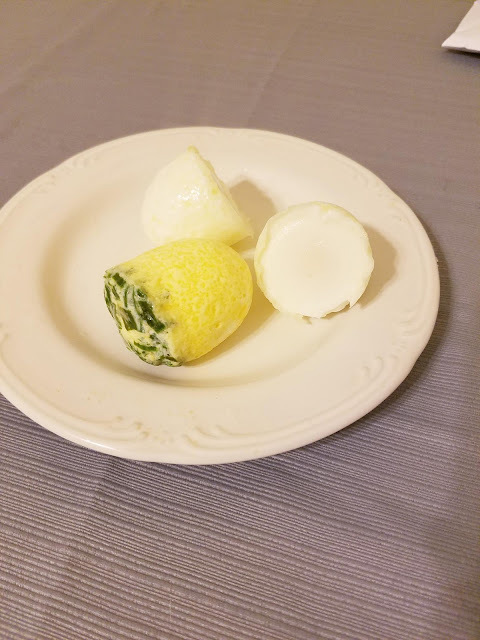 I have had the best luck making hard boiled eggs with my new Instant Pot - every single one cooks and peels perfectly. Before that? I was lucky if any peeled properly. Yes, I've heard the instant pot for eggs is the way to go! I just bring the eggs to a boil, turn off the heat immediately and let the eggs sit in the hot water for 10 minutes or so. Personally I don't need more "stuff" laying around. Haha, I certainly don't need more kitchen gadgets either. I have the same process as Marcia and once that 10 minutes is up I put them in ice water and I'm all set. If the process isn't simple I would never make them! That is normally my process too but for some reasons it's not working for me! 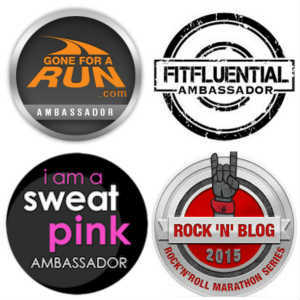 Interesting product! I think I'd just stick with what I know. Usually putting them in iced water (after they've boiled) helps the shells come off pretty easily. I love boiled eggs on salads! I usually do that too. Perhaps I just need more practice! 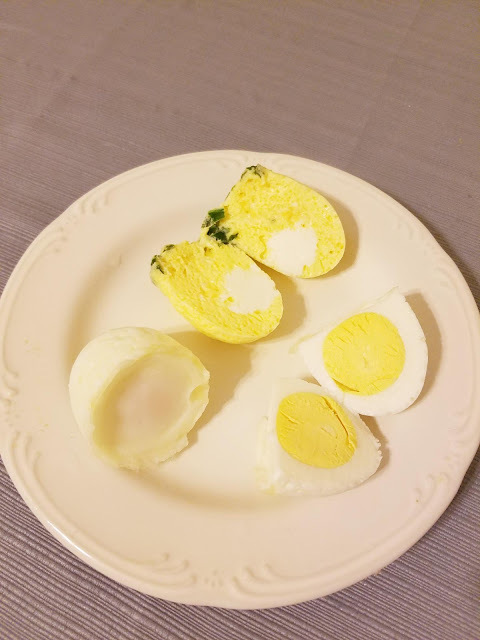 I was very excited to read this post since I have recently been eating a lot of hard boiled eggs. Sometimes they do not peel easily so what I started doing was not peeling them until I eat them! Then I only have to peel one or two at a time and I am much more calm because I know it will most likely only take me a minute! 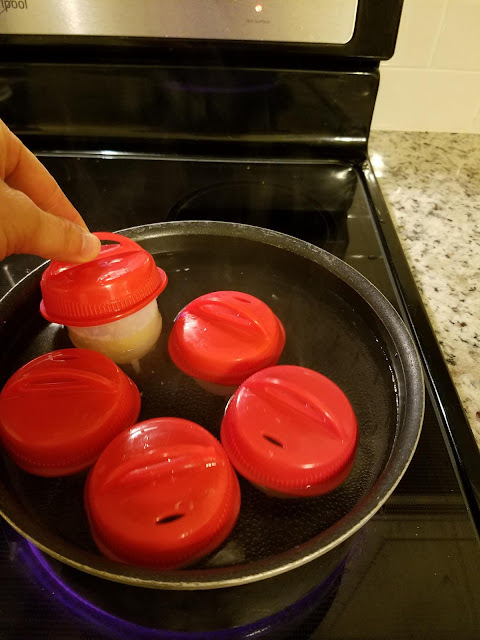 When I make hard boiled eggs, I put the eggs in the pot and dump water on them. Then I bring the eggs to a boil. Once they are boiling, I immediately remove them from the heat (they are covered this whole time.) I let them sit for 14 minutes. Then I put them in a bowl and dump water with ice on them. I let them sit for an hour, then I peel them. we eat a lot of eggs and usually soft boiled. so I can't really imagine using this method! we start with cold water, bring to boil and then let boil exactly 3 minutes. We then "shock" them with cold water and eat almost immediately. If I remember then I use a splash of vinegar in the water so when I peel them the shell doesn't stick to the egg. Very interesting! I saw this last week online and wondered how it worked. I like the idea of not having to peel the eggs once they are boiled!